Some sentences may have seemed too severe, but none was harsher than the punishments meted out to innocent people by the regime these men served. Spain: Day 62 of 985 of the Spanish Civil War. Spain: Day 427 of 985 of the Spanish Civil War. CBI - China: Day 72 of 2,987 of the 2nd Sino-Japanese War. Day 35 of 106 of the 2nd Battle of Shanghai. Day 16 of 70 of the Battle of Taiyuan. Spain: Day 792 of 985 of the Spanish Civil War. CBI - China: Day 437 of 2,987 of the 2nd Sino-Japanese War. Day 98 of 139 of the Battle of Wuhan. Atlantic: During the first convoy attack of the war, Germany sub U-31 sinks the 4,060-ton British freighter SS AVIEMORE in British waters. U-31 will go on to gain distinction as the only submarine that will be sunk twice in the war. Poland: Day 16 of 36 of Germany's Invasion of Poland. CBI - China: Day 802 of 2,987 of the 2nd Sino-Japanese War. Day 4 of 26 of the 1st Battle of Changsha. 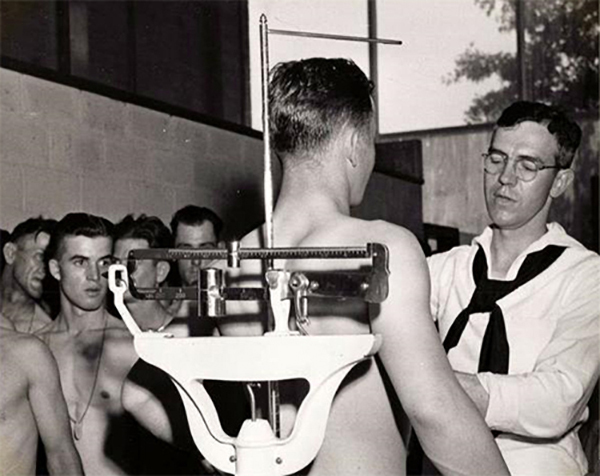 USA: US Military Conscription bill is passed, beginning the first peacetime draft in American history. Some ten million men will be pressed into service. Nearly six million others (men and women) will eventually enlist voluntarily into the various branches of the US military. Conscription has been employed several times in US history, usually during war but also during the nominal peace of the Cold War. The United States discontinued the draft in 1973, moving to an all-volunteer military force, thus there is no mandatory conscription. However, the Selective Service System remains in place as a contingency plan. Men between the ages of 18 and 25 are required to register so that a draft can be readily resumed if needed. In current conditions, however, conscription is considered unlikely by most political and military experts. ETO - UK: Day 11 of 258 of the Blitz. Piccadilly, Park Lane, and Bond St are hit in night raids. ETO - UK: Day 69 of 114 of the Battle of Britain. MTO - Egypt: Italian 10th Army captures Sidi Barrani, Egypt. At this point the Italians halt their offensive and begin to construct a number of fortified camps. East Africa: Day 99 of 537 of Italy's East African campaign in the lands south of Egypt. CBI - China: Day 1,168 of 2,987 of the 2nd Sino-Japanese War. Day 307 of 381 of the Battle of South Guangxi. Day 28 of 42 of the Hundred Regiments Offensive. Russian Front - Finland: Day 87 of 164 of the Battle of Hanko. The Soviets will be forced off their leased naval base. Russian Front - Finland: Day 13 of 28 of Finland's reconquest of East Karelia in southern Finland. The Soviets continue withdrawing from Finland back to Leningrad. Russian Front - Finland: Day 80 of 142 of Operation SILVER FOX, a joint German-Finnish campaign to capture the Russian port of Murmansk in the Arctic. The German troops continue withdrawing back into northern Finland. Russian Front - Finland: Day 78 of 140 of Operation ARCTIC FOX, a joint German-Finnish campaign against Soviet Northern Front defenses at Salla, Finland. Russian Front: Day 87 of 167 of Germany's Operation BARBAROSSA, the overall invasion of the USSR. Russian Front - North: Day 9 of 872 of the Siege of Leningrad. Russian Front - South: Day 40 of 70 of the Siege of Odessa, Ukraine. Russian Front - South: Day 25 of 35 of the 1st Battle of Kiev, Ukraine. Guderian's Panzer Group 2 and Kleist's Panzer Group 1 meet east of Kiev, trapping five Red Armies. MTO - Libya: Day 160 of 256 of the Siege of Tobruk. Middle East: Day 23 of 24 of the Anglo-Soviet invasion of Iran. The Shah of Iran abdicates and his son, Crown Prince Mohammad Reza Pahlavi takes over. East Africa: Day 464 of 537 of Italy's East African campaign in the lands south of Egypt. CBI - China: Day 1,533 of 2,987 of the 2nd Sino-Japanese War. Day 11 of 33 of the 2nd Battle of Changsha. Russian Front - North: Day 374 of 872 of the Siege of Leningrad. Russian Front - North: Day 135 of 658 of the Siege of the Kholm Pocket, USSR lays siege to the Kholm Pocket but the Germans hold out for a about a year and a half. Russian Front - Center: Day 49 of 64 of the 1st Battle of Rzhev-Sychevka, Russia. Though it will end in a stalemate, it will keep German troops from going to Stalingrad. Russian Front - South: Day 81 of 150 of Germany's CASE BLUE, the failed offensive to take the Caucasus oil fields. Russian Front - South: Day 25 of 165 of the Battle of Stalingrad, the bloodiest battle in human history. The main railway station changes hands several times through the day. MTO - Libya: US B-24s attack Benghazi. MTO - Greece: US B-24s attack shipping at Pylos Bay, Sphakia, Khalones, and Pylos Island. East Africa: Day 135 of 186 of the Battle of Madagascar. The Governor General of Madagascar asks for an armistice. CBI - China: Day 1,898 of 2,987 of the 2nd Sino-Japanese War. PTO - Alaska: Day 102 of 435 of the Battle of Kiska, Aleutian Islands. The US and Canada will defeat the Japanese invaders. PTO - Malaya: Day 210 of 357 of the Battle of Timor Island, a long guerrilla war ending in Japanese victory. PTO - New Guinea: Day 58 of 119 of the Battle of the Kokoda Track. The Australians continue pushing back the Japanese troops. This will become an Allied victory. PTO - Solomon Islands: Day 41 of 187 of the Battle of Guadalcanal. Lithuania: As the Vilnius (Vilna) Ghetto is about to be liquidated, German Major Karl Plagge overcomes resistance from local SS officer and forms a free-standing Slave Labor Camp into which he moves over 1,000 Jews to relative safety. ETO: RAF's Dambuster Squadron makes a disastrous first use of 12,000 lb Tall Boy bombs with a raid on the Dortmund-Ems canal. ETO: US 8th Air Force: B-17s and B-26s attack several targets in France. 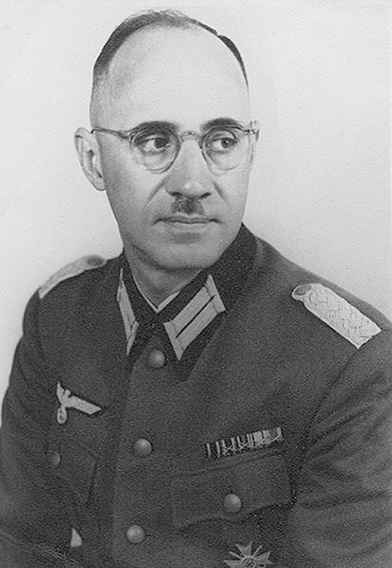 ETO: Julius Ritter, an aide to Nazi Labour Minister Fritz Sauckel, is shot to death in broad daylight on the Etoile in Paris by the Resistance. 50 Frenchmen are executed in reprisal. Russian Front - North: Day 739 of 872 of the Siege of Leningrad. Russian Front - North: Day 500 of 658 of the Siege of the Kholm Pocket, USSR lays siege to the Kholm Pocket but the Germans hold out for a about a year and a half. Russian Front - Center: Day 41 of 57 of the 2nd Battle of Smolensk, Russia. Becomes a Soviet victory as the Axis are pushed completely away from the Moscow region. Russian Front - Center: Day 31 of 48 of the Battle of Bryansk, Russia. German troops continue evacuating Bryansk, some 200 miles southwest of Moscow. Russian Front - South: Day 24 of 122 of the Battle of the Lower Dnieper River, USSR. Russian Front - South: The Black Sea port of Novorossiysk is captured by the Soviets after a week of amphibious and land operations. MTO - Italy: German attacks at Salerno come to a halt as the US 5th Army ties in with the Taranto invasion force which forms a solid Allied line across southern Italy. The US 9th and 12th Air Forces provide the air cover. MTO - Greece: British occupy the island of Leros in Aegean Sea. MTO - Yugoslavia: Tito's partisans are reported to have captured Split on Yugoslavian coast. CBI - China: Day 2,263 of 2,987 of the 2nd Sino-Japanese War. PTO - New Guinea: Day 148 of 148 of the 2nd Battle of Lae-Salamaua. Australians and US troops have secured this section of New Guinea. PTO - Solomon Islands: Day 33 of 56 of the Battle of Vella Lavella. The Allies will win this one. 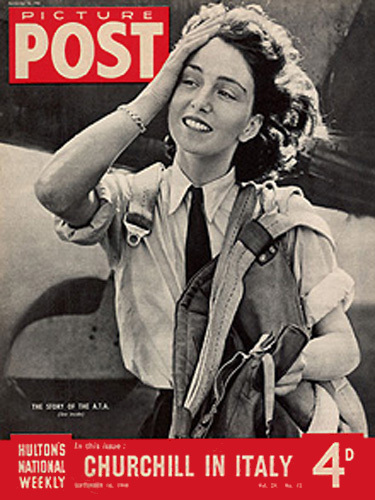 UK: First Officer Maureen Dunlop of Britain's Air Transport Auxiliary is featured on the cover of Picture Post magazine. It will become a very famous photo, emblematic of increasing usefulness of women in the war effort. Maureen Adele Chase Dunlop de Popp was an Argentina-born British pilot with dual nationality. At the outbreak of war, Dunlop decided to actively support the war effort. To join the Air Transport Auxiliary (ATA), women pilots needed a minimum of 500 hours of solo flying, twice that of a man. After sufficiently increasing her hours, in early 1942 Dunlop and her sister traveled across the Atlantic Ocean on a neutral Argentine-registered ship. While her sister joined the BBC, in April 1942 Maureen joined the ATA, one of 164 female pilots eventually to do so in three years. Trained to fly 38 types of aircraft, her 800 hours subsequently logged included time in Spitfires, Mustangs, Typhoons and bomber types including the Wellington. She later stated that her favorite type to fly was the de Havilland Mosquito. Initially attached to No.6 Ferry Pool at RAF Ratcliffe near Leicester, she then moved to the all-female Ferry Pool at Hamble, Southampton, which exclusively delivered Spitfires from Supermarine's new factory at RAF Southampton. She was forced into occasional emergency landings, once after the cockpit canopy of her Spitfire blew off after take off and another occasion put down in a field after the engine of her Fairchild Argus failed in the air. Dunlop became a cover girl when pictured pushing her hair out of her face after she left the cockpit. The shot featured on the front page of Picture Post magazine on 16 September 1942, proving women could be fearless as well as glamorous, and integral to the war effort. ETO - France: Day 47 of 284 of the Battle of Brittany. ETO - Belgium: Day 15 of 62 of the liberation of Belgium. ETO - France: Day 2 of 236 of the Siege of Dunkirk. ETO: US 8th Air Force: P-47s and P-51s fly strafing missions in Germany. Russian Front - Finland: Day 2 of 223 of the Lapland War. Finland and Russia have joined forces to kick the Germans out of Finland's most northern province. Russian Front - North: Day 3 of 41 of the Battle of Riga, Latvia. Russian Front - Center: Day 3 of 72 of the Battle into East Prussia and northern Poland. Russian Front - South: Day 3 of 72 of the Battle of Belgrade, Yugoslavia. MTO - Italy: US 12th Air Force medium bombers attack positions at Bologna and Rimini while fighters hit areas in the Apennine Mountains. MTO - Italy: US 5th Army forces struggle to break through the strong enemy defenses in northern Italy. MTO - Greece: The British make an unopposed landing on the Greek Island of Kythera off the Peloponnese. CBI - Burma: Day 169 of 302 of the Chinese Salween Offensive in Burma. CBI - China: Day 2,629 of 2,987 of the 2nd Sino-Japanese War. Day 153 of 259 of Japan's Operation ICHI-GO. PTO - New Guinea: Day 277 of 597 of the Battle of New Britain. PTO - New Guinea: Day 148 of 481 of the Battle of Western New Guinea. PTO - Palau Islands: Day 2 of 74 of the Battle of Peleliu (Operation STALEMATE II). War is hell, but it can also be hilarious. The title refers to the ubiquitous graffiti that US servicemen scrawled in bizarre and unlikely places; a joke that everybody was in on.